Funeral services were held Tuesday, December 26, 1972 at 2 p.m. for Arthur Kost, 61, who was killed late Wednesday afternoon, December 21, 1972. He was killed when the truck he was driving left the road and overturned, a short distance north of Washburn on Highway 83. Road conditions were extremely icy at the time, according to McLean County Sheriff Arlin Thompson, who investigated the accident. The Rev. J.G. Sortland was in charge of the services. Special music was given by Tom Schultz, soloist, with Mrs. R.G. Bickert, organist. Burial was in Riverview Cemetery. Pallbearers were Don Kost, Jack Dutoit, William and Harry Larson, Dennis Kost, and Harvey Reimers, all nephews. Henne Funeral Home in Washburn was in charge of the arrangements. Mr. Kost was born June 14, 1911 in Olivet, S.D. to Henry and Katherine (Lagge) Kost. The family moved to the Washburn community in 1916. 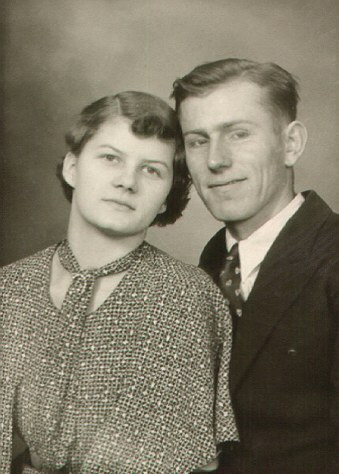 Mr. Kost married Adeline Larson December 23, 1933, in Washburn. They farmed four miles east of Washburn. Mr. Kost was an active member of the National Farmers Organization. In addition to his widow he leaves one foster son/nephew, Alfred Carvell, Washburn; one foster daughter, Mrs. Robert (Evonne) Daugherty, Santa Maria, California; two brothers, Rudolph and Albert, both of Washburn; and two sisters, Mrs. Alice Tweeten, and Mrs. Earl Sorum, both of Washburn, and four grandchildren. Adeline Kost, 78, Missouri Slope Lutheran Care Center, Bismarck, formerly of Washburn, died June 10, 1993, in the care center. Services will be held at 10:30 a.m. Monday at Washburn United Methodist Church, Washburn, ND. Burial will in Riverview Cemetery, Washburn. Visitation runs from noon to 9 p.m. Sunday, and will continue one hour prior to services at the church. Adeline Larson was born June 6, 1914, in rural Washburn, the daughter of Louis and Hattie (Ecklund) Larson. She grew up on her parents' farm and attended rural school. She also attended Washburn High School. She worked for area farm wives until she married Arthur Kost December 23, 1933, in Washburn. They made their home on farms east of Washburn before settling on a farm two miles east of Washburn, where they farmed. Her husband died in December of 1972. She continued to make her home on their farm until she became a resident of Missouri Slope Lutheran Care Center in 1990. Adeline was a member of the Washburn United Methodist Church and the Washburn Lewis and Clark Senior Citizens' Club. She enjoyed gardening, raising flowers, and traveling. She is survived by one nephew-son and daughter-in-law, Al and Janet Carvell, rural Washburn; two grandchildren, Monte Carvell, Bismarck, and Brenda Jones, Chicago; two great-grandchildren, Andy and Jack Carvell, both of Bismarck; one brother, Walter, Paducah, KY; one sister, Irene Reimers, Bismarck; one foster-daughter, Eyvonne Daugherty, Santa Maria, CA; and many nieces and nephews. ND photo by Mike McCleary, shows the Bismarck Capital with a field of sunflowers in the foreground. No breast was more filled with hope. No soul was more fraught with faith. We anguish over your passing. no one to take your place. We had to lose you to learn of real love. all waving goodbye to a beautiful man. "So long, but for a day . . .
old laughter, old love, and old prayer."